Perhaps the most unique EZkeys piano to date, Mellotoon is based on the Mellotron keyboard introduced in the early 1960s. This unique instrument was the first of its kind to include samples of real instruments, but as opposed to the modern-day digital sampler, the Mellotron pulled them off a magnetic tape loop that ran inside the keyboard. It came with various sounds for piano, strings, flutes, brass and is likely best described as the first-ever “band in a box”. Naturally, it was a revelation from the get-go. Today, this piece of instrument history is enjoying a massive resurgence in a wide range of genres. And of course, Mellotoon incorporates the powerful songwriting features of the EZkeys engine ensuring that your write the songs, not the program. Transpose full MIDI tracks on the fly, add playing styles from other MIDI or use the groundbreaking EZkeys Chord Wheel to customize chord voicing and harmonic color – and much, much more. Already own an EZkeys piano? Get Mellotoon for just £54.95 by purchasing the EZkeys Sound Expansion. 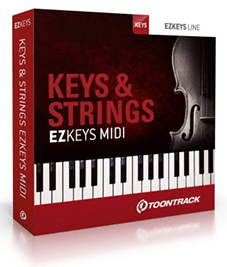 Toontrack have also released the EZkeys Keys & Strings MIDI pack which perfectly complements EZkeys Mellotoon. Keys & Strings EZkeys MIDI was created with the Mellotron, with its rich palette of sounds and music history in mind. However, it works just as well with any instrument in the EZkeys Line. What sets it apart from some of the other packs in the line is that it comes with two separate but related sections in each song, one for keys and one for strings.